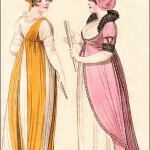 Fashions of London and Paris, February 1805. During this early period, we are as likely to see evening hats with full dress as not. 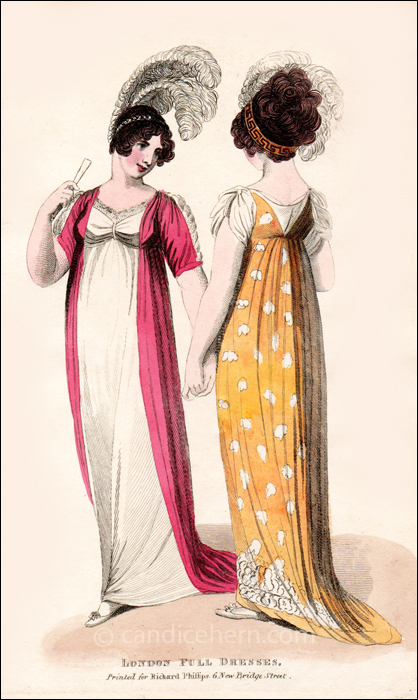 Here, both models wear simple bandeaus in their hair, with large ostrich plumes. 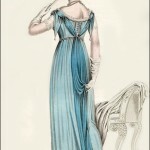 Plumes with evening wear will go out of fashion in a few years, but the bandeau will remain a popular trend through the Regency, allowing elaborate, high hairstyles to be shown to their best advantage. “TWO FULL DRESSES. Fig. 1–A robe of ruby-coloured velvet, made loose from the shoulders in front, and very low in the back; short sleeves of velvet and white crape. The robe worn over a dress of white crape, the front of which is looped down with a diamond brooch, and trimmed with a quilling of blond lace. The hair dresses with a bandeau of diamonds and white ostrich feathers. White kid shoes.